CAPE CANAVERAL — Quietly stationed like a sleeping giant in the Orbiter Processing Facility-2 is the last piece of NASA’s historic shuttle program. The Space Shuttle Atlantis lies waiting to reach its final resting place. “Young people and the people in school, that’s the future,” said David Bakehorn, a shuttle systems technician who worked for over 27 years on the shuttle program. The shuttle program started with its first launch on April 12, 1981. Since then its assisted in taking astronauts into orbit, launching and repairing satellites and helping to construct the largest man-made structure in space: the International Space Station. Atlantis played a major role in all of this and more over the course of its 26-year career, spending over 293 days in space across 33 different missions for NASA. Only five space shuttles were built including both the Columbia and Challenger, along with the now retired Discovery, Endeavor and Atlantis. Like so many American artifacts, the retired shuttles have been sent off for display around the nation. 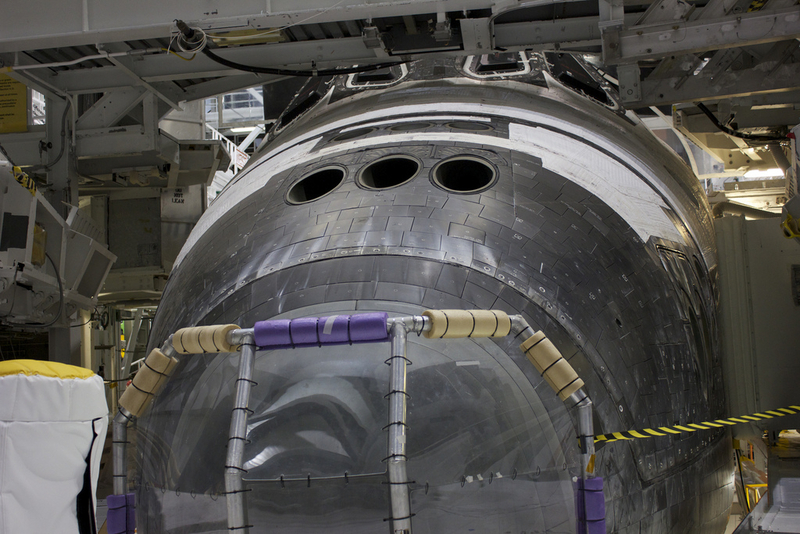 Discovery will be on display at the Smithsonian Institution’s National Air and Space Museum in Washington, D.C. Endeavor will be displayed at the California Science Center in Los Angeles. Atlantis’ body of approximately 22,237 silica block tiles of varying shapes and sizes look as if they have just returned from a mission. Subtle scratches and small imperfections round out the outer shell. Inside Atlantis, the crew compartment and flight control deck are surprisingly cramped considering the fact that six to eight persons shared the area in flight. In full operation mode every nook and cranny was used to full advantage for work and recreation during long space missions. 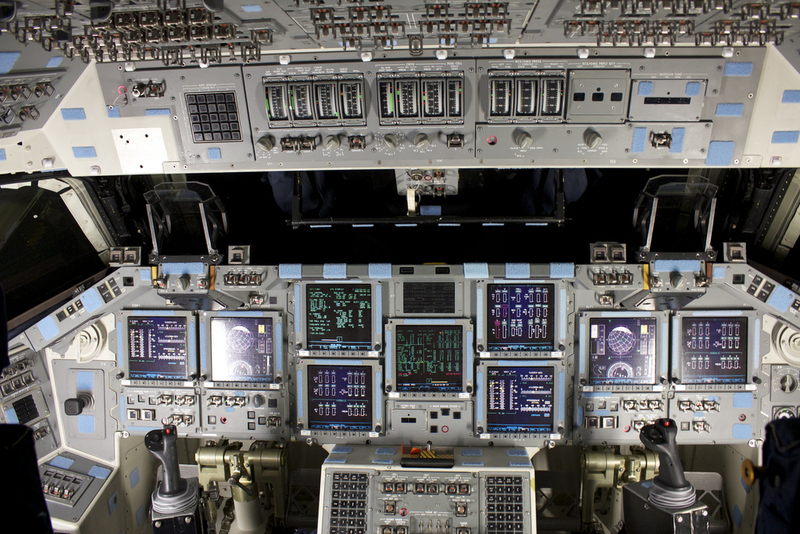 The cockpit is filled with an impressive array of switches, buttons and screens that resemble present-day commercial aircraft. This craft’s control system is far richer and more complex in function due to the needs of spaceflight and extended life support systems. “Taking care of these vehicles up until the very end and delivering them to their final homes and knowing that we were part of that is very special,” said Stephanie Stilson, who works as NASA’s flow director for the transition and retirement of the orbiters. The foundational work laid by the shuttle program now acts as the blueprint for the future of NASA and American space exploration. Private companies such as SpaceX, Boeing and Lockheed Martin are currently building the next generation of spacecraft intent on delving deeper into our solar system than ever before. Lessons learned from the shuttle program's 30-year legacy are currently defining the next great leaps in space travel and scientific discovery. “Orion is using the thermal tiles, and so is the Boeing X-37 ‘little shuttle’ and the Sierra Nevada, so this technology is definitely carrying over to the next generation,” said Greg Grantham, a NASA thermal protection specialist. Atlantis is currently being prepared for public display at the Kennedy Space Center Visitor Complex with a targeted grand opening in July 2013. 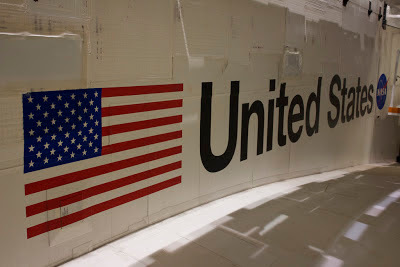 Side view of Atlantis showing the United States flag and NASA logo. Front view of the Space Shuttle Atlantis presenting fuselage of the vehicle. 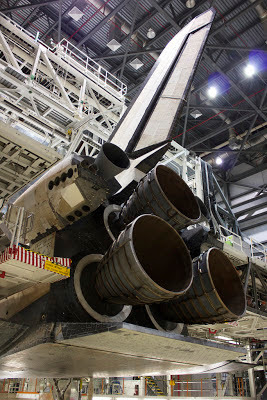 Tail view of Atlantis showing the main engines. 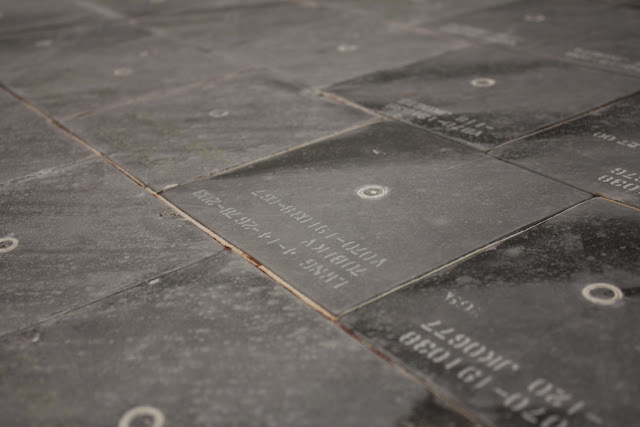 A close-up look at the slightly worn heat shielding tiles used to protect the orbiter upon its reentry from outer space.